The Opus West Russell Ranch Project, the development on “Lot C” (formerly Lowe’s site), is moving forward with the development of an office complex. The first steps are to present a concept review to the city council next week, and to prepare an EIR. The property’s entitlements (i.e., what they are already allowed to do as part of the development agreement) currently calls for a maximum of 376,000 sq. ft., no taller than 4 stories, with appropriate parking. The community has asked Opus for the project to have more of a campus feel, and a mix of uses. 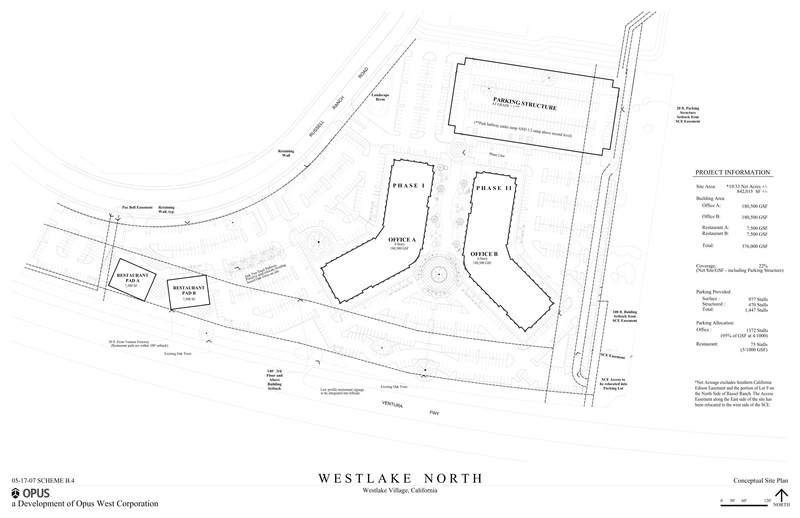 Furthermore, with office building being the greatest source of the traffic peaks for Westlake Village, others have called for both a fitness center and restaurants to be on the property. The thinking is that this would mitigate and spread out traffic peaks by giving good reasons for Opus tenants (as well as others on Russell Ranch Road) to stay in the area immediately surrounding the offices instead of going onto Lindero Canyon. Other advocates just want these additional services available in the area. The Opus proposal is for 361,000 sf of office space, and 15,000 sf for two free standing restaurants (total of 376,000 sf) plus a 2 story parking structure. Opus has said that they are willing to add in another restaurant, a fitness center, and some service retail integrated with the fitness center (or a subset of these). The EIR will consider the effects of these proposals. And, the option for going either way until late summer or Fall when the City Council would decide which it prefers. To put these project sizes in perspective, the current project is about 80%, and the alternative project 92%, of the size of the Westlake Park Place (the Townsgate office complex being built on the Thousand Oaks side of Westlake Village near Gelson’s). Or, about 3x the size of Costco. Opus West has entitlements on the property that allow them to build with confidence that the city would not be able to unreasonably withhold approval. That’s what a “development agreement” is all about. When looking at properties like this, many cities use a FAR (floor area ratio). This is a tool for measuring density on a property while still allowing for multi-story structures. FAR is calculated by taking the total sq. footage of the building, and dividing it by the sq. footage of the property. To put this in perspective, the property within the city of Westlake Village with the highest FAR rating to date is the former Westlake Hospital site with a FAR of 0.47. In Westlake Village, most commercial and industrial sites come in with a FAR of 0.35 — some lower, and even fewer higher. The current Lot C Development Agreement includes a maximum FAR (floor area ratio) of .55, with four story buildings not to exceed 71 feet, and 376,000 sq. ft. of uses including office space, restaurants, retail and accessory uses. Even though there are entitlements, the City maintains the right to approve site layout, architectural features, building materials, design, and mitigation of a condition that is dangerous to the health/safety of residents. That said, the City can not unreasonably hold or delay any discretionary approvals. And, it cannot make the developer build something smaller/different to what the entitlements (above) give. While the city cannot force the developer to use the property in any way, the city can “give” on other issues that have value to the developer. The task becomes to find the balance between what the city can “give” on, and the value that has to the developer. While there are many (even possibly most residents) that would like to see a town center or something similar, to date there’s not been enough incentive for Opus to change from the current office building strategies. Back in March, there was a “Community Workshop Meeting” where the community could give feedback directly to the developers (Opus West) on what they would like to see. This was not to the city council, but to the developers. At the beginning of the meeting, Ray Taylor (the city manager) announced that the Council members agreed that they would listen but not participate in the discussion. They sat in the audience. At the meeting, residents suggested such items as a walking trail, interior open on the weekends for people to use, retail space, tennis courts, skate rinks, a park, and a town center. The developer made it clear that they are building office space on this property, and while they would look at things like a walking trail and try to put in more restaurants and such, they were clear that this is going to be developed primarily as a set of office buildings. Some people have since suggested that the Sunrise development be moved to Lot C, or that some other type of assisted living facility be placed there. This is not possible. The previous owner placed a deed restriction on the property that states if “lodging” is put on this property, the land ownership would revert back to him. Presumably this was done out of consideration to the Marriott. Opus West did say that they were looking at restaurants. Specifically, higher quality, lunch and dinner establishments. They used Morton’s Steak House, and McCormick & Schmick’s Seafood Restaurant, as examples — but it appeared that these were just examples, and that there are not in active discussions at this time. Currently the project is in the stage of preparing an Environmental Impact Report (EIR), and is about to have its concept review before the city council. An EIR looks at a minimum of these topics: aesthetics, air quality, biological resources (with a focus on the oak trees, noise, traffic and circulation), but may include others as deemed appropriate. Contrary to popular belief, an EIR is not something that the city puts out to bid. Typically, the city gives the developer two choices — the developer can put the EIR out to bid through an RFP (request for proposal), or they use Wildan (a provider that the city uses for other services). If the developer decides to go out to bid, then once there are proposals in hand, the developer and the city will jointly review and agree on an acceptable provider (with the city being open to most qualified firms). Historically, when timing is an issue, developers go with Wildan, otherwise, they usually go through the RFP which can take a couple of months. On a quick investigation, it appears that Wildan has done only one EIR in the past 10 years in Westlake Village … the Lowe’s project. As a result, because of this work, Wildan is already familiar with the area and issues, and can more efficiently produce an EIR for Opus, and with the limited time frame for Opus to begin building, Opus chose Wildan. Once the EIR provider is determined, the *city* commissions the EIR so that it is clear to the provider that the EIR is for the city, and not influenced by the developer. That said, the developer ultimately reimburses the city for the EIR costs. Obviously, the goal is for the EIR to be produced to assess the environmental impact, without bias either in favor or against the project. On April 10th, the city held a “scoping” session for the EIRs for both the Opus West Russell Ranch Project and the Sunrise development. While there were a variety of public comments on it, the purpose of the meeting was to define what should be included in an EIR for these projects. One item that was specifically called out by the people creating the EIR was traffic. The traffic portion of the EIR will take into account updated traffic counts of the newer developments coming online. For those items that are not yet live, they will use industry standard estimation methods so that the new flows are addressed. The EIR uses a proposed project description as the basis for the project it is looking at. To keep both options open, the EIR will look at the larger (alternative) option because it is a super set of all options. Currently, these descriptions are as follows. The 376,000 sf project (already within entitlements) will include two four story office buildings. Each office building will consist of 180,500 sq. ft. of office space for a total of 361,000 sq. ft. In addition, there are two free restaurants totalling 15,000 sf. And, on the first floor of building “A”, there will likely be some services typically available in an office building (sundries, title services, bank, etc…). This is the maximum allowed by the entitlements, and a .40 FAR. The alternative 435,000 sf project proposal would include all of the above, plus a third free standing restaurant (6000 sq. ft.). In addition, one 45,000 sq. ft., two story fitness club with an additional 8000 sq. ft. of attached service retail shops. This would be to the North of the office building. This sq. footage could be less depending on the prototype of the operator, and assuming there is interest from an operator. To satisfy the parking needs required by the city, on-site parking will be a combination of surface and a 2 story parking structure for a total of 1,645 vehicles. It appears that an additional level would be below grade, and two levels above grade (e.g., ground level plus a second deck). Currently, the parking lot is positioned to the east. If the fitness center goes in, the structure will be 3 levels above ground, further away from Russell Ranch hidden behind the fitness center. The resulting proposal would be a total of 435,000 sq. ft. (a FAR of .46). To put this in perspective, the existing Costco is 136,000 sq ft. on a property about half the size. And, the Lowe’s/Retail/Restaurants proposal was 227,000 on this property (the Lowe’s itself was the equivalent of about 2 stories tall and 168,700 sq. ft.). The new eight building development, Westlake Park Place http://www.westlakeparkplace.com/details_overview.php, on Townsgate on the Ventura County side of Westlake Village is 471,000 sq. ft. on 27 acres (a FAR of .40) … so the expanded Opus West Russell Ranch project would be closest in size to the Westlake Park Place project. The primary view from Russell Ranch Road will be the restaurants (to the West), then surface parking, backed up to a view of one of the 4 story buildings (the other is behind that), and the fitness center. Here is a B&W rendering — which will be updated in the next week with additional renderings, and color versions. Many people believe that specific restaurants are slated for the project, but generally that’s not determined until the development is closer to completion. They are typically classified … like “full service restaurant,” but not a specific brand. This makes sense as if you were a restaurant owner, you wouldn’t want to commit to a location until it is further down the development path. The first step here is to do the concept review in front of the city council, and complete the EIR, which will take some time. The overall package of information, including the EIR, is what the city council reviews and ultimately votes on sometime later this year. Should the impact go beyond what one would reasonably expect the entitlements to produce, the city could ask the developer to mitigate those effects. That said, residents should consider it unlikely that there will be significant impacts that cannot be mitigated by the developer. Again, when it does come time for the city to approve the development, they cannot unreasonably withhold that approval. In other words, the withholding of approval would have to be for items that are beyond what one would reasonably expect, based on the entitlements. For example, traffic impact and air quality are not likely to be impacts that the city can act on. For the expanded development to move forward as proposed, the city council will need to approve a planned development permit, a parcel map to subdivide into commercial parcels of different sizes, and an oak tree permit for the removal of one or more of the mature oak trees. The city is currently talking to the developer on how to minimize the oak tree impact, but those discussions are still in an early stage. Unless something unforeseen happens, probably the biggest decision that will fall to the city council is whether Opus West should build the 376,000 sf project under current entitlements, or build the larger 435,000 sf (or a subset of it) to included additional fitness center, service retail and/or restaurant. The City Council agenda for the next meeting on May 23 includes a “concept review” of this project. As always, speakers can come and speak for up to 3 minutes on this or other topics.